Your First Choice Car Wash & car Detailing Company Located In Oshawa & Ajax Ontario! We clean your car inside and out quickly! We're also competitively priced! Mr. Shine Car Wash has 2 locations in Oshawa in Ajax. We serve Durham region residents and the Greater Toronto Area community at large. We provide a full service car wash and auto detailing for a great affordable price. We pride ourselves on offering fast quality customer service. Our interior and exterior car detailing service is great for a professional business look. We understand that cars get dirty and you do not always have the time to clean it yourself. In addition poor wash and detailing services, can lead to a wide variety of preventable car maintenance issues. We are open 7 days a week to the public. 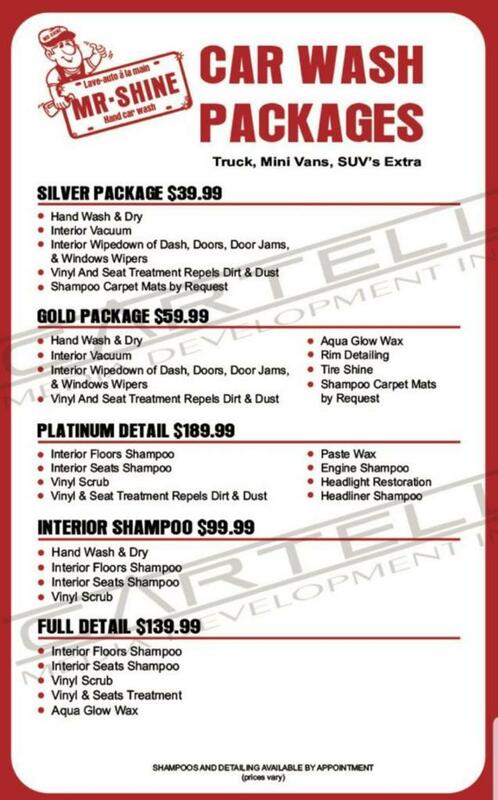 Please call in advance if you would like to book a car detailing service at either our Oshawa or Ajax location. Other than that you can just drop by, because we have a fast in and out car wash service. Our fast car wash service includes interior, and exterior. We vacuum all the car carpets, dashboards, seats, etc. We clean and shine the exterior giving your car a nice sparkly finish. Call Us We're the local car wash and car detailing professionals! Want your car cleaned quick for an affordable price hassle free? Our car detailing team has the experience necessary to get your car cleaned thoroughly. We will ensure that your car interior and exterior is cleaned top to bottom to look like its brand new. What keeps people coming back to Mr Shine Car Wash Oshawa and Ajax is the fact that we go above and beyond for a fair price. We charge a flat rate for quick in and out car washes. We wash each car by hand and if you don't have time to make an appointment don't worry, you can just drop in! Book Your Professional Car Detailing Service Now! Please Leave Us A Review On These Platforms!